The Primary voting is over and the General Election match-ups are set in Iowa’s four congressional districts. Iowa is losing one seat in the U.S. House. The state was divided into four congressional districts last year. 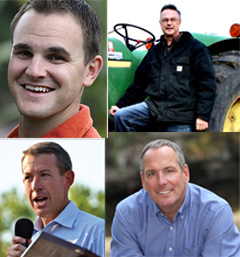 In northeast Iowa’s first district, Democratic Congressman Bruce Braley of Waterloo will face Republican Ben Lange of Independence in November. Lange lost to Braley by just under two percent in 2010 and Lange told Radio Iowa last night that he’s better prepared for the rematch. “The second time I played T-ball, I was better at it as well,” Lange said. Lange promised to be an aggressive challenger. “It’s going to be my job to go out there and make sure voters really know where Bruce Braley stands on the issues, being the only member to vote against the balanced budget amendment from the Iowa delegation, voting seven times to increase the national debt limit,” Lange said. Lange suggested Mitt Romney’s ability to carry Iowa in November may hinge in the results from the first congressional district. Lange defeated Rob Blum, a businessman from Dubuque, by an eight-point margin in yesterday’s primary. Blum isn’t ruling out another run for public office. Democratic Congressman Dave Loebsack moved from Mount Vernon to Iowa City in the second district to avoid a Democratic primary battle with Braley. Then this spring Loebsack found himself in a primary. Loebsack easily defeated State Senator Joe Seng, a Democrat from Davenport, in yesterday’s voting. Loeback’s Republican challenger in November is John Archer, a lawyer from the Quad Cities. Archer defeated fellow Republican Dan Dolan, a home builder from Muscatine, in Tuesday’s voting. The final tally was 61 to 39 percent. Archer argues Loebsack’s been the least productive member of Iowa’s congressional delegation. Loebsack said “SuperPacs” and other national groups will target the second district . Read election results on the Secretary of State’s website. As you likely know, Iowa currently has five congressmen. Republican Congressman Tom Latham moved to Clive and will run against Democratic Congressman Leonard Boswell of Des Moines in November. Latham’s move out of Ames avoided a primary battle against fellow Republican Congressman Steve King. Former Iowa First Lady Christie Vilsack of Ames was unopposed in yesterday’s primary and is now the official Democratic nominee for the fourth district and the challenger to King’s bid for reelection. Iowa Republican Party chairman A.J. Spiker suggests a Republican sweep of all four races is possible. Iowa Democratic Party chairwoman Sue Dvorsky said the two incumbent Democrats are well prepared to face the winners of Tuesday’s primaries in the first and second districts. Voters will go to the polls again, in 153 days, to decide these General Election match-ups.